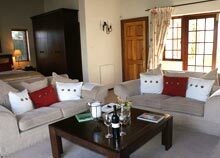 WedgeView Country House & Spa boasts stunning views of the surrounding Vineyards and Stellenbosch Mountains. With 18 Luxurious individually decorated Rooms & Suites, 2 pools, large gardens, raised deck lapa and the Spa for a relaxing treatment, WedgeView Country House & Spa is the perfect retreat for leisure and corporate. 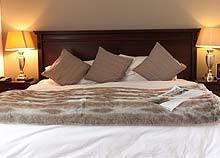 Our rates include Full English & Continental Breakfast, VAT at 14% is included and Tourism Levy at 1% is excluded. 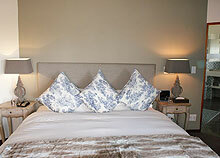 There is a choice of two (2) Deluxe Rooms, rooms 13 and 14. These two Deluxe rooms are our cheapest rooms and both situated on the ground floor. 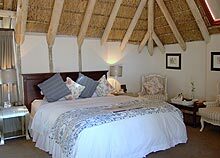 Room 13 ("Oscars"), has a cosy bedroom with open thatch roof. It has a private courtyard, but unfortunately no views. 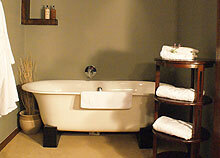 Room 13 can be combined with room 1 (Honeymoon Suite) as the Luxury Family Suite. The Courtyard Deluxe Room 14 ("Hermitage") is entered through a semi-private Courtyard and can be combined as "The Courtyard Family Suite". Both Deluxe Rooms have air-conditioning (cooling and heating), en-suite bathroom with separate bath and shower and under floor heating in both bathroom and bedroom. There are 4 spacious Garden Deluxe Rooms (Room 3 “Stadstuin”, Room 4 “Linde”, Room 5 “Butte aux Bois” and Room 6 “Le Garage”). Each room has an en-suite bathroom with separate bath and shower, air-conditioning (cooling and heating) as well as under floor heating in the bedroom. 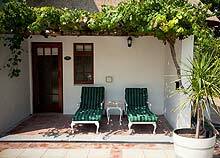 All the rooms also have a semi-private patio from which you can enjoy the tremendous garden and the spectacular views over the vineyards and Stellenbosch Mountains. Our two (2) beautiful, contemporary designed Vineyard Rooms (No.16 & 17), situated on the first floor of the recently added new building. 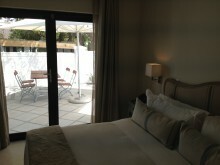 Both rooms offer a small private "French Balcony"* with sliding doors which can be completely opened from where you can enjoy the spectacular views of the sunset over the Vineyards. 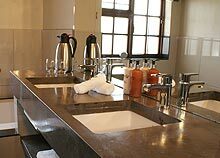 Each room has an en-suite bathroom with separate bath and shower, air-conditioning (cooling and heating) as well as under floor heating in the bed- and bathroom. *Please note that it is a so-called French Balcony and it is not spacious enough to sit on the French Balcony. On our first floor are our five (5) Superior Rooms, all with a characteristic "semi-open" Thatch ceiling (Room 7 “Lansink”, Room 8 “Tram”, Room 9 “Princebosch”, Room 10 “Vogelenzang” and Room 11 “Old Dutch”. 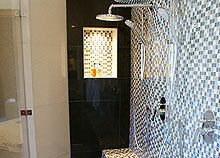 Each room has an en-suite bathroom with separate bath and shower, air-conditioning (cooling and heating) as well as under floor heating in the bathroom. 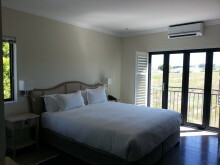 The Superior rooms have a balcony with breathtaking views over the surrounding vineyards and Stellenbosch Mountains. Two of these rooms ( 7 & 8) can be connected through interlinking doors, which is a perfect option for families or friends. 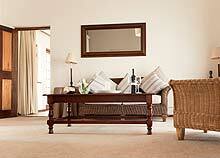 This lovely spacious open thatch suite is based on the first floor of the main house ( No. 12, “Euryanthe”). 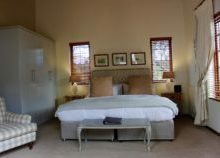 The room has an extra length king-size bed, cosy intimate private lounge and stunning bathroom with a romantic double walk-in rain down shower as well as a spacious bath. Bathroom and bedroom both have under floor heating and there is also air-conditioning in the room (cooling and heating). This is the perfect Suite for a romantic getaway. 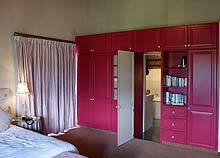 This Honeymoon Suite ( Room 1, “Bloemenbeek”) is situated on the ground floor and consists of a Master bedroom with spacious private open lounge, a small spare room which can be used as baby room, small office or luggage storage and a bathroom with Spa bath and shower. 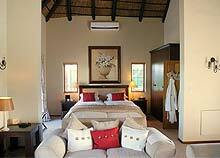 The suite has air-conditioning, under floor heating in bed- and bathroom and direct access to our lagoon pool. This special Suite is named after the Dutch Country Hotel & Restaurant, "De Bloemenbeek", in de Lutte, Twente, who also serve the exclusive Zonneweelde Wines in the Netherlands and has a strong liaison with WedgeView. The Courtyard Suite, No. 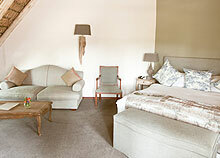 15, "Waarbeek", consists of a spacious private lounge with Flatscreen TV, fully equipped kitchenette for the guests who would like a self-catering option, a large master bedroom with a contemporary designed en-suite bathroom with a romantic double walk-in shower, double basin and separate bath. 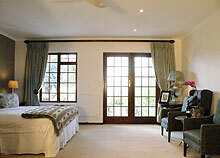 This suite can be combined with the Courtyard Deluxe Room as the Courtyard Family Suite. 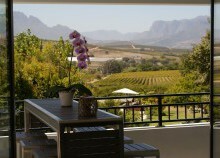 From the courtyard you can enjoy an amazing sundowner overlooking the vineyards at the back. 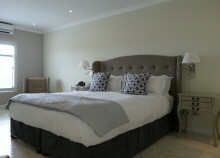 This Garden Family Suite (Room 2, “Korenbeurs”) is in our main house on the ground floor. In addition to the open lounge and main bedroom, it also has a second bedroom with 2 single beds which can be made into a king size bed. 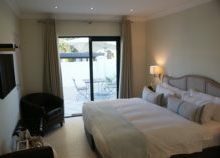 The cosy suite has a private patio at the back with direct access to our lagoon pool through the en-suite bathroom with bath and seperate shower. 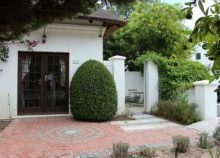 This Suite also has a private terrace at the front with breath-taking views and awesome sundowners over the Stellenbosch Hills, Vineyards and Mountains. 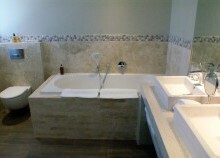 The bathroom has access through the main bedroom. 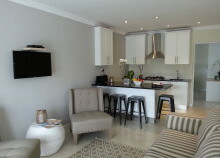 This suite is the perfect option for a family with 2 adults and 2 children under 18 years. The privately situated Luxury Family Suite is a combination of 2 rooms on the ground floor, connected through an interlinking door. The rooms that are interlinked are Room 1, “Bloemenbeek” and Room 13, “Oscars”. The Master Bedroom (which is known as the Honeymoon Suite) consists of a spacious private lounge, en-suite bathroom with separate shower & Spa bath, a small spare room which can be used as baby room, office or luggage storage and direct access to a "semi-private" lagoon pool. 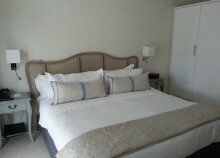 The Master Bedroom is attached to the Deluxe Room, with its own en-suite bathroom with separate shower & bath. The Courtyard Family Suite is entered through the privately situated courtyard and is also a combination of 2 rooms (the Courtyard Deluxe Room No. 14 and the spacious Courtyard Suite No. 15) connected through an interlinking door. 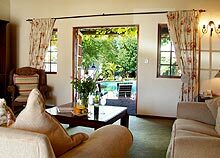 The Courtyard Suite consists of a spacious private lounge with fully equipped kitchen (fridge, stove and microwave) and Flatscreen TV, large master bedroom with en-suite bathroom with a romantic double walk-in shower & separate bath. The Courtyard Deluxe Room is connected to the lounge of the Courtyard Suite and has its own en-suite bathroom with separate shower & bath. The generously proportioned Presidential Suite (approx. 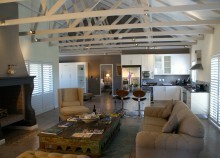 150 m2) is designed with the discerning luxury traveller in mind with careful attention to detail. The Suite boasts a beautifully contemporary decorated lounge with romantic fireplace, a fully equipped open plan private kitchen. The front balcony is equipped with a bar set and sunbeds and boasts a splendid view. The balcony at the back is equipped with a Braai (bbq), dining table and relaxing lounge chairs from which you can enjoy the most stunning sundowners. It offers a large bedroom with extra length (220 cm) Super King Size bed, a luxurious bathroom en-suite with relaxing Spa Bath and walk-in shower.